Traditional loans work well for established, well-documented businesses that need to make large investments. A traditional loan remains an alluring small business funding option for one reason: a competitive APR. With a traditional loan, you borrow a lump sum and gradually repay it over a predetermined length of time, typically 1–10 years. If you need a lot of cash and don&apos;t expect to be able to pay it all back soon, a traditional loan might be your best option. Securing a traditional loan can be challenging and time consuming. If your business is young, or you lack collateral to secure the loan, it may be difficult to obtain a traditional loan. Application requirements vary, but often include personal and business credit histories, financial statements, a business plan, and cash flow projections. A decision may take anywhere from a week to several months. Business credit cards and lines of credit are best for recurring expenses and purchases you can pay off before interest kicks in each month. They can be easier to get than most forms of small business financing options. With business credit cards, you can free up cash for less predictable needs, build your business credit profile, and gain rewards such as airline tickets and cash back for your business. However, plastic can be an expensive form of business funding when you go beyond such targeted uses, and use it for things like cash advances. Credit card cash advance fees are often high. Some credit cards charge a higher APR for cash advances than they do for purchases– and that&apos;s on top of the cash advance fees. Marketplaces and peer-to-peer platforms are good for fledgling businesses with near-term capital investment needs. Marketplace and peer-to-peer lending platforms don&apos;t lend money themselves. Instead, they match borrowers and lenders. Borrowers can often gain access to business funding quickly, making these online platforms an attractive small business financing option. Marketplaces typically market and service the loans, sometimes in partnership with, or on behalf of, an originating bank. You receive your business funding from many different investors, ranging from individuals to institutional investors. Each platform calculates interest rates based partly on proprietary credit scores. A product or service with a compelling angle. Would your venture make for an interesting news story? Time and resources to create and deliver the necessary rewards for donors. Sufficient marketing resources to promote the campaign, or at least enthusiastic supporters who will spread the word. Kiva: A unique option for microbusinesses. Kiva combines crowdfunding with peer-to-peer lending. First, join the Kiva community by making a loan to another small business. Next, you invite family and friends to begin your funding. Once their contributions reach a baseline amount, you may qualify for a no-interest loan with no fees. Unlike other loan providers, Kiva relies on local trustees –such as service organizations and community leaders – to vouch for borrowers. Learn more at kiva.org. Merchant cash advances are best for filling short term needs when you have difficulty qualifying for other options. With a merchant cash advance (MCA), you get a lump sum in return for selling a sale of your future sales that you pay back with a percentage of your sales until the advance is repaid. Merchant cash advance lenders typically base approval and terms on your sales history more than on your credit rating or other factors. Because repayment amounts fluctuate with your daily sales, an MCA can have a gentler impact on cash flow than a term loan can. But fees may be high, and a lack of robust regulation means it&apos;s especially important to take the time to understand all of the terms. Payment gateway lending. A payment gateway is a company, such as PayPal, which processes credit and debit card transactions, that may offer access to small business financing options for businesses that regularly use its services. A payment gateway assesses risk primarily by using what it already knows about your business and sales patterns, instead of obtaining a business or personal credit score. Most payment gateway loans are issued by a non-affiliate bank and share many characteristics with merchant cash advances, but can offer more favorable terms. You typically get a lump sum for a fixed fee, and agree to use a percentage of your sales to repay the combined amount. PayPal Working Capital1 eases the strain of uneven cash flow by basing repayment on a fixed percentage of sales. You choose the loan amount (up to a maximum based, in part, on your PayPal account history), as well as the percentage of sales used to repay the loan.2 There are no early repayment or other fees, and no credit check or personal guarantee required, so applying does not affect your credit score. Upon approval and acceptance, PayPal Working Capital funds can be deposited into your PayPal Business account within minutes to be spent immediately for your business needs. Finding the best funding option for your business is a decision too important to rush. Invest the time it takes to learn the terms of any small business financing option you&apos;re considering. 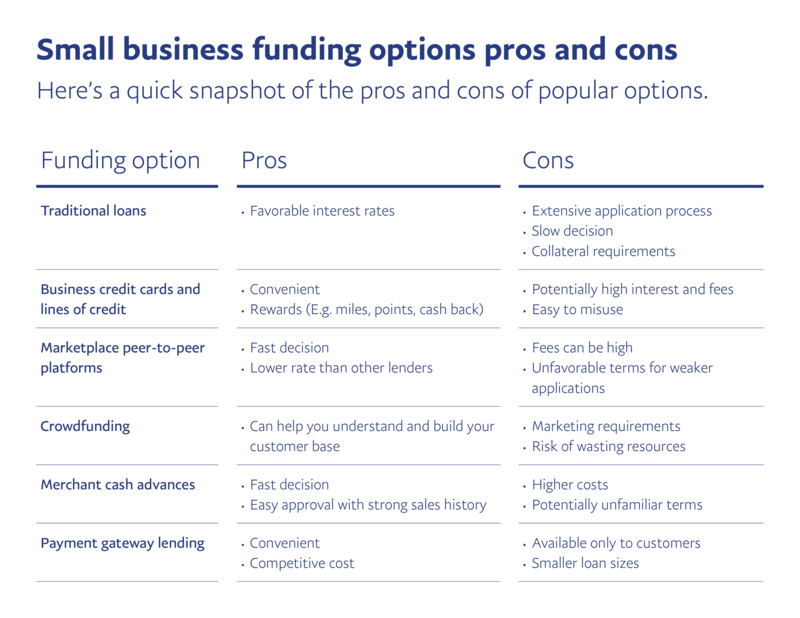 You can also learn more about the small business funding options highlighted here by downloading our ebook: Financing options for small businesses. The information in this article has been prepared by PayPal and is for informational and marketing purposes only. It does not constitute legal, financial, business or investment advice of any kind and is not a substitute for qualified professional advice. 1PayPal Working Capital is subject to credit approval, as determined by the lender, WebBank, Member FDIC. To apply for PayPal Working Capital, your business must have a PayPal business or premier account for at least 90 days and process between $15,000 (or for premier accounts $20,000) and $20 million within those 90 days or within any time period less than or equal to 12 months. PayPal sales include processing on PayPal Express Checkout, PayPal Payments Standard, PayPal Payments Pro, and PayPal Here. 2Minimum payment required every 90 days. See Terms and Conditions for details. 4The lender transfers funds to your PayPal Business account as fast as the next business day if the lender has received the documents the lender asked for and approved the loan by 5:00 p.m. Eastern Time, Monday through Friday (excluding bank holidays). 5In addition to the fixed fee (Total Interest Charge) for the loan, the only other cost is a $20 Returned Item Fee that is only assessed if a payment is returned. Get fast access to fixed payment loans from $5,000 to $500,000. 10 tips for starting a small business. One of the hardest parts about having a great idea for a new product or service can be figuring out a way to sell it. The many options for structuring a business, funding it, and reaching customers can make even the simplest decisions feel monumental and overwhelming.